The convenience of pick up and delivery dry cleaning combined with superior customer service ensures your satisfaction. Place your items in the bag. Place your order in your office service area on your pick-up day. Your order is picked up. No need to call, we always check the area. And deliver it back to you. Your order is delivered to your service area where you can pick it up at your convenience. Pressed4Time provides a timesaving service that simplifies busy lives. The convenience of our pick up and delivery dry cleaning, laundry, alterations and shoe repair services, combined with superior customer service creates a customer experience that ensures very satisfied and loyal customers. We understand that families are busier than ever and need to find ways to better manage their time. 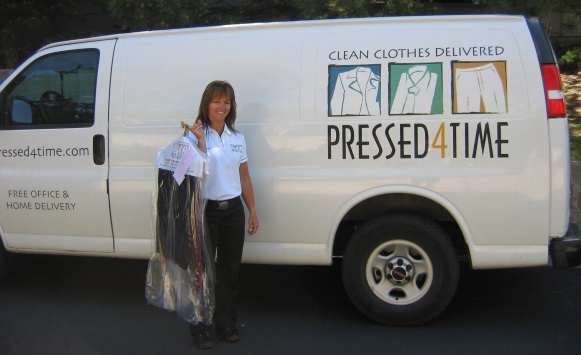 When it comes to affordable, and convenient dry cleaning, Pressed4Time is the undeniable choice. Pressed4Time uses only environmentally friendly dry cleaners, and by cutting down on the number of trips you take in your vehicle you're reducing your own carbon footprint as well. Your personalized ID tag on your bag ensures your clothes are always delivered on time and to your satisfaction. Just leave your order in your designated pic-up area and we'll take care of the rest.